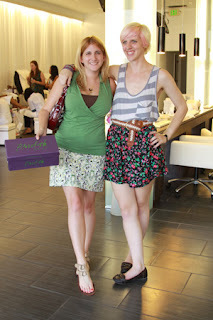 Last week, Blowfish Malibu shoes invited me and several other L.A. bloggers to a night of pedicures and fun! Blowfish is a fresh and inventive line of edgy-cool footwear designed with the trendsetting set in mind and for a affordable price. I wasn't familiar with the brand until this party, but Blowfish shoes can be found at many specialty stores as well as Macy's and DSW. I got to see several of their shoes on display though from Gladiator sandals like this Maya flat sandal to the now popular platform cork heels again for a 70s summer look (like this one). You can enter to win a free pair in their Shoe-A-Day Giveaway on their Facebook page. Not that I'm one to know much about shoes, but those look pretty comfy and stylish. Good choice. oh that looks like so much fun, those sandals are too cute! Tara, your feet are TINY! How tall are you? I'm just under 5'4" and am a size 8. If you're looking for spring and summer fashion on a budget, consider Blowfish shoes. 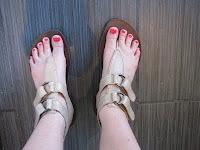 Budget friendly, fashion forward and well made, these shoes can bring your old outfits new life!